(KGTV) - When it comes to owning a car, the saying goes: "It's not the age, it's the miles." 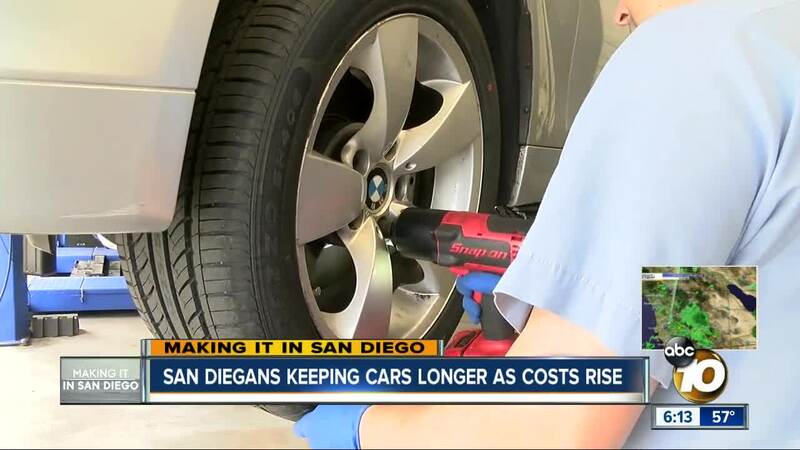 Now, a new study says 11.7 percent of car owners in San Diegans are saving money by keeping their cars for more than 15 years, the sixth highest rate in the nation. "Back in the 80s and 90s, we would see vehicles and they would start breaking down at 100,000 miles," he said. "Now, with new technology, we're seeing vehicles with 200, 250,000 miles." The study, from Iseecars.com , says the Toyota Highlander, Prius, Sienna, and Tundra, and the Honda Pilot are the top five vehicles kept 15 years or longer. It's easy to see why. Edmunds says the average price for a new car is now $35,973, while the typical pre-owned car sold a dealer is going for $20,080. Still, people who keep their cars a long time have to maintain them diligently, said Doug Shupe, a spokesman for the Auto Club. He said the best way is to follow the schedule in each car's manual. "Spending that money in maintaining that vehicle could go a long way and save you in costly repairs down the road," Shupe said. Shupe said driving style matters, meaning it's best not to push the car too much. He added that quality of gas also counts. A study by the Auto Club found that drivers using gas with so-called Top-Tier Standards had 19 times fewer engine deposits than those that didn't after 4,000 miles. "The rule of thumb on that is the value of your vehicle versus the repair price," Banuelos said.